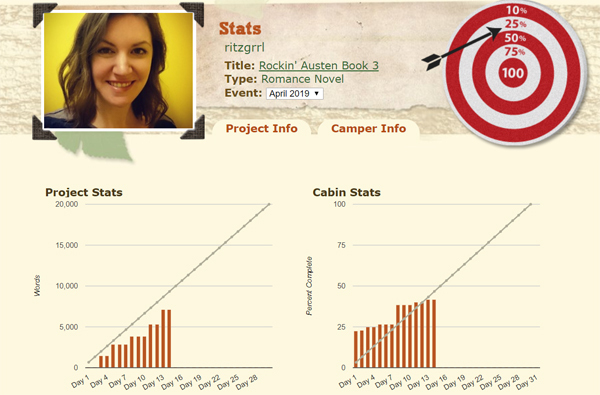 We’re halfway through Camp NaNoWriMo, and it’s been going pretty much how my Camps usually go—slow with plenty of stops and starts. I set a goal for 20,000 words for the month, and considering all the stuff I have coming up in the next couple weeks, I probably won’t hit it. What I will do though, for sure, is finish the first draft of my third Rockin’ Austen book, based on Persuasion. While I was looking for a line to use to participate in the #SunWIP Twitter hashtag, I stumbled upon this scene, squeed, and found it too cute not to share. To set up the scene a little, assistant director Jenna runs into the lead actor, Weston, her former high school boyfriend, in the hotel lobby where they’re staying. I left in my editing notes in brackets, so you can get a peek at my drafting process too. She wasn’t stupid. Jenna was nothing if not well prepared. An hour later, when she was sure everyone had evacuated the lobby and was either room-bound or pool-bound, Jenna tiptoed back to see what kind of food they had in their overpriced shop. She needed ginger ale and all the crackers she could find if she was going to rally by tomorrow morning. The fates were in the business of making it impossible to get away from Weston though, so of course she would find him back in the lobby. This time, his hair was wet, but thankfully he had a shirt on. He was sitting in one of the cushy chairs, facing the fireplace, on his phone. Was he talking to his ex-girlfriend? Maybe they had worked it out. Oh gosh, maybe he was inviting her to set. Jenna wanted to run, but the ding of the elevator made him turn. She froze like a deer in headlights [cliche] “Sorry, I wasn’t eavesdropping on your conversation with your…” Jenna wasn’t sure whether to refer to her as his girlfriend or his ex-girlfriend. Jenna wrinkled her nose. “You still eat those? I remember you loved those in high school.” She immediately shut her mouth, hoping she didn’t bring up painful memories by mentioning their past life together. “So the trail mix then?” He dropped the Cheetos bag into his lap. Jenna took a few steps closer, just close enough so that she could reach her arm all the way out and pinch the edge of the trail mix bag between two fingers. He held fast to the bag and smirked as she tugged. His question startled her, and she may have even physically flinched as she was turning to go. She was only expecting to hear the words, “goodnight” or “bye” or maybe a uninterested grunt in her general direction. The last thing she was expecting was further conversation. Weston ripped his Cheetos bag open, kicked back in the chair he was on, and propped one ankle on the opposite knee as he dug into his snack. Unsure of how long she was supposed to stay, Jenna walked over to the chair across from him, waited a moment, and finally lowered herself into it, the trail mix bag pinned between her knees. She was too nervous to eat in front of him now. She could take care of appeasing [wrong word] her stomach in her hotel room later if she survived this conversation without throwing up. “Hey, can I ask you a weird question?” He took his hand out of the bag, and his fingers were covered in reddish-orange dust. “Sure.” She hoped it wasn’t about their past relationship. Although she longed to get his thoughts on the matter, she couldn’t do it on an already queasy stomach. She eased the bag of trail mix open and popped a couple peanuts in her mouth just in case. “My band does need a director for their music video, but that’s probably beneath you.” He said it so casually that Jenna wasn’t sure what to make of it. His eyes weren’t even on her. They were watching the TV with national news playing behind her head. “I’ll be here,” she squeaked.